Page 25 line three. The strong force actually stays roughly constant in strength as two quarks (or other colored objects) are separated, rather than growing. The overall argument is still valid though, because the potential energy between the quarks grows. 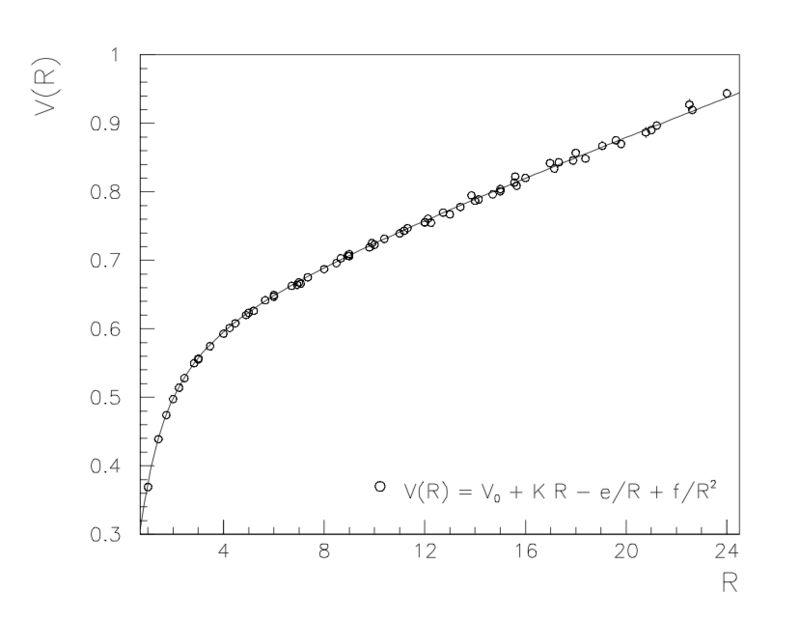 For physicists etc, Force F = dV/dR and V (potential) is proportional to R (separation) at large R. See e.g. Ellis, Stirling and Webber Fig. 2.9 for a lattice QCD calculation of this (below). Thanks to Bryan Webber for reminding me of this… Actually it really was “reminding”, since I learned lots of my QCD from their book, which is a classic text. Page 35, about a third of the way down. The discovery was in 1995, not 1996 – see the references here. Weird, I was sure I remembered the first “observation” paper being dated 1996. Should have checked. Thanks to Peter Jenni for being the first to spot this one.